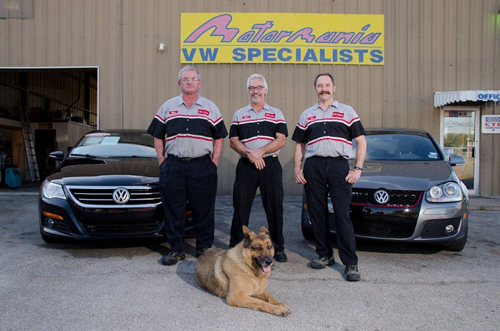 With over 140 years of combined experience in the automotive industry and over 30 years in Austin, Motormania is a full service repair center specializing in all makes and models of Volkswagen and Audi vehicles. Whether your car needs major repairs or regular routine maintenance, Motormania has the facilities and the expertise to get the job done. We work hard to repair your car, truck, or van in a timely manner so that you can be back on the road quickly. From scheduling to service delivery, we strive to make your experience with Motormania as comfortable and hassle-free as possible, and we’ll always keep you informed about your vehicle’s progress so that there are no surprises when you pick up your car. Motormania is an independently owned and operated facility. All work is guaranteed. We provide honest, easy-going, and courteous service, and we are usually able to schedule your work within one or two business days, offering a timely and economical alternative to the dealership. Call Roger, Tom, or Matt at 512.331.0877 for a free consultation or request an appointment. For detailed information about our capabilities, see the Services page. © 2010 VW & Audi Repair Austin Round Rock & Cedar Park TX | VW & Audi Service | Auto Repair Austin TX | VW Repair Austin | Audi Repair Austin. Powered by Wordpress.